James Walshaw has revealed his disappointment after leaving Guiseley to join Altrincham – claiming that the club’s failure to contact him about a new deal forced him to go. The 29-year-old will link up again with ex-Farsley Celtic chief Lee Sinnott and Villagers striker Damian Reeves at Alty after his second spell at Nethermoor ended in unfortunate fashion. 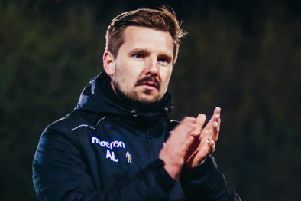 Ex-Ossett Town, Bradford Park Avenue and Farsley frontman Walshaw insists he was ready to talk the Lions about staying, but says that boss Steve Kittrick – who first brought him to Guiseley towards the end of the 2008-09 season – didn’t call him and say he was in his plans. Kittrick has countered by saying he was waiting for clarification on the club’s playing budget for next term before speaking to players and says Walshaw’s decision was premature. Walshaw said: “It was a very tough decision and I don’t think it was one made by myself. I hadn’t heard from the manager since the last game and kind of thought that he didn’t want me. “There were a few clubs interested and I didn’t want to be waiting around, so I took the decision to sign for Altrincham. “It would have been nice to have had the choice. “I am disappointed. I have got a lot of friends at Guiseley and a close bond with supporters and it has not ended on a good note for me. “I had interest from Stockport and Altrincham and a few others including Ferriby. But I decided to join Altrincham and I am looking forward to linking up with Damian Reeves and Lee Sinnott. Offering his own take, Kittrick said: “I have said to players not to jump before sailing. I have hardly spoken to anybody yet. “He has now taken it out of my hands. Why is it always a manager who has got to ring players? Why didn’t he ring me and ask what was going on? “It is only now I know where I am with the budget. Walshaw, who scored ten goals in 29 appearances for the Lions last term, initially joined Guiseley in the spring of 2009 and found the net 27 times in 2009-10. He was top-scorer again with 32 goals in 2010-11 and after spells at Darlington and FC Halifax Town, he rejoined the Lions in early 2012 when the Quakers hit financial trouble. On his time at Guiseley, he added@ “My main highlight was when won the UniBond Premier on the last day of the (2009-10) season and beat Ashton 2-0 and I got both goals. Jake Lawlor and Rhys Mennell have signed new deals with Guiseley for next season. Kittrick also revealed that four other senior players have also agreed to commit their futures to the club.